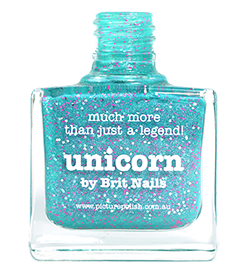 The Nail Arcade - Indie/International nail polish store in the UK! Some exciting news today! The Nail Arcade is a new online UK stockist of indie and international nail polishes, and it's opening up for a week long pop-up event from August 4th to August 11th. UK bloggers and nail polish addicts will know it can be a huge pain to source indie/international polishes without big shipping costs, so this is great news for all of us! The Nail Arcade is run by a lovely girl called Rachel and I'm really hoping she gets plenty of support in her venture. For the pop-up event, The Nail Arcade will be stocking Dance Legend, Smitten Polish, Serum No.5, Cadillacquer, Crazy Polish Lady, Franken Frosting and Jindie Nails. Some really exciting indie brands there, and all easily available to us UK people...I've got a feeling I'll have to sit on my hands! Rachel has sent me a couple of polishes that she'll be stocking to show you. 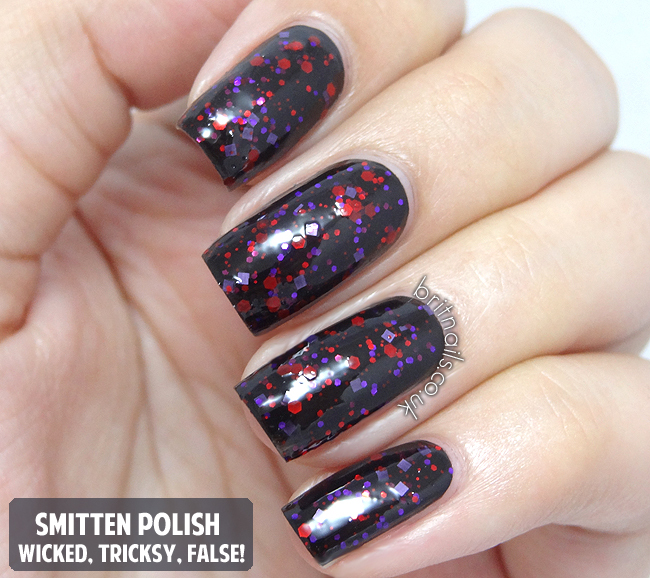 First up is my very first Smitten Polish! Wicked, Tricksy, False! 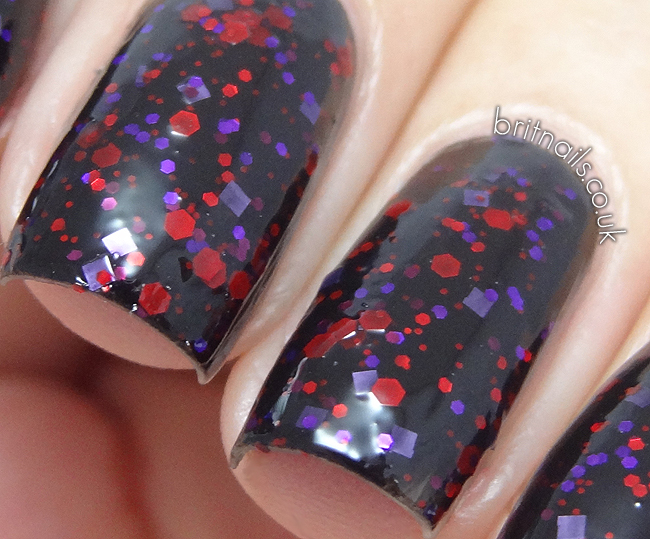 is a mix of red and purple hexagonal glitter and square glitter in a black jelly base. This takes around 3 coats to build up to a solid colour on it's own, but I've layered 1 coat over a black creme as it's so densely packed it really doesn't need more than 1 coat. I added 2 coats of top coat to smooth it out. Wonderfully spooky, makes me think of a witches brew! 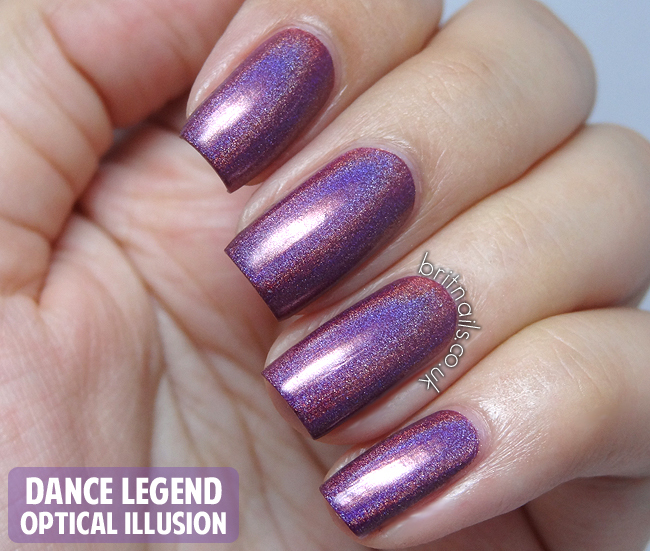 Next is Optical Illusion by Dance Legend. I've reviewed Dance Legend polishes before, and I'm a huge fan of their Prism (holographic) polishes, they're stunning! This will be a great opportunity to grab some. Both of these polishes will be available at The Nail Arcade! All polishes stocked will be less than £10 each, with bonuses for large orders. I think I will definitely be indulging. To keep up to date with the launch, follow The Nail Arcade on Facebook and Twitter. There is currently a giveaway over at their Facebook page too! (UK only) and remember, the pop-up shop is open from August 4th til August 11th!